Your main character, Sean Suh, really left an impression on me. He’s at once frightening and vulnerable. Where did Sean come from and what was it like climbing into his persona each day as you wrote? Wendy: Thank you for your kind words! I am so glad you enjoyed the book. As you seem to have intuited, Sean left a hell of an impression on me as well. Writing him was emotional and harrowing, but the deeper I got into his head, the more I started thinking about him the same way he thinks of himself—as a nice person who doesn’t want to hurt anyone. I was exploring different kinds of predators and debating which ones were more dangerous, the psychopathic ones who plan their crimes carefully or the unpredictable ones who are never quite in control? After writing Sean, I think it is the latter. He doesn’t feel like it’s really HIM who is dangerous; it’s “the beast” inside him, which lets him off the hook for his crimes. It’s that separation that I think makes him a truly frightening character. But nice. He’s a really nice guy. Heather: As a child of the 80’s, I love all the cultural references to this time period (I may have sported big hair and leg warmers at one point) you made throughout the novel: television shows, music, fashion. Why did you choose Texas in the 1980s to tell your story? Also, given the plot, I wanted a lot of tension as we wait for the police to find Sean’s California records, which would be diffused by the computerization of criminal records. Lastly, I just thought the grittiness of the 80s fit the story! It felt so right, and I went with my gut. Heather: I love your website. You have an interesting game for readers there ~ can you tell us about it? write short, quick pieces, and I thought it would just be fun! So I’m doing it! Every month, I send out an installment of a story. At the end of it, there’s a link for you to choose what the main character does next. If you choose correctly, you get entered in a giveaway. If you choose wrong, your character dies a horrible death. You can sign up anytime on my website at www.wendyheard.com. Heather: I’m signing up right now! Tell us, what books are on your bedside table right now? Wendy: I have an ARC of TEMPER, a thriller by Layne Fargo at the top of the stack. It’s out 7/2/19 from Gallery. I have The Vegetarian by Han Kang, which I’m rereading because it is HAUNTING ME, In The Vines by Shannon Kirk, and Hollywood Ending by Kellye Garrett. I have a collection of Japanese death poems I keep dipping back into. I really need some comic relief from all this heaviness I’ve been reading (and living in 2018), so I usually have something lighter as well, but I’m out of material. I need something new if anyone has recommendations! I love all genres including YA. Heather: You heard it here folks, Wendy needs some lighter reading material! Wendy, can you give us a little hint as to what you are working on next for readers? Wendy: Yes! My second book comes out in December 2019, also from MIRA. It’s about a young woman who joins a vigilante murder club to save her younger brother from their dangerous foster mother. It takes place in inner city Los Angeles, my hometown, and has taken a huge chunk out of my heart. Honestly, I don’t think I have ever poured myself into a book as thoroughly as I did with book 2. You may notice I have not mentioned the title. That’s because it doesn’t have one yet! (All the authors just laughed a little. Titles are so funny.) Hopefully we will have one to share soon. Heather: I’m so glad that we connected! How can other readers connect with you? Wendy: The summoning spell for me is the word “murder” spoken three times in front of a mirror while holding a red candle. 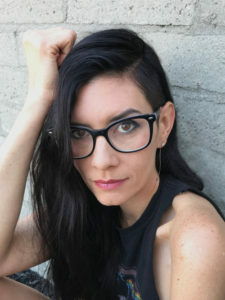 You can listen to me on the Unlikeable Female Characters podcast, http://bit.ly/UnlikeableFemaleCharacters, which is available for download on iTunes and everywhere else. You can go anywhere they sell coffee and you’ll probably find me there as well. Thank you, Wendy! 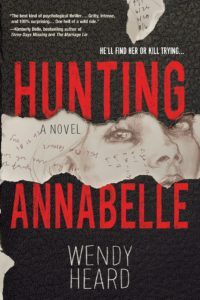 And all readers out there ~ HUNTING ANNABELLE is available Dec. 18, 2018!